When you need surgery for problems affecting your heart or lungs, you want to be sure you’re getting the best care. Our team is led by experienced, board-certified cardiothoracic surgeons and includes highly trained nurses and technical specialists who’ll ensure you receive the highest quality of care before, during, and after your surgery. 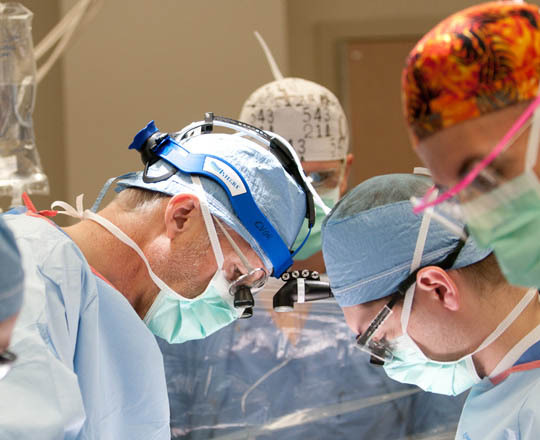 St. Luke's is a center of excellence for valve surgery and our cardiothoracic surgeons perform hundreds of cardiac surgical procedures each year. Of these, approximately 50% are isolated aortic or mitral valve replacements, mitral valve repair, or a combination of coronary artery bypass graft (CABG) with valve replacement or mitral valve repair. Our highly skilled team also treats conditions of the esophagus and lungs, including tumors, cancer, and pleural disease. Surgery capabilities include traditional chest surgery and esophagectomy, as well as minimally invasive, video assisted thoracic surgery (VATS) for biopsies, lung lesion removal, and lobectomy. We also perform minimally invasive staging of the mediastinum including endobronchial and endoscopic ultrasound, transcervical thymectomy for treatment of myasthenia gravis, and chest wall resection and reconstruction. Our team offers innovative treatments to address conditions such as coronary artery disease, heart valve disorders, lung disease, and vascular disease. A new aortic valve is delivered to the heart on a catheter through a small incision in an artery in the groin.